From fairy tale weddings to plastic surgery rumors, Angelababy is without a doubt the hottest celebrity at the moment. To catch the wave before it dies down, Chinese streaming site LeTV has secured the rights to broadcast the romantic comedy Bride Wars <新娘大作战>, which stars Angelababy and Ni Ni (倪妮) as two bride-to-be’s. The movie has been showing on LeTV since October 18. Bride Wars, a remake of the 2009 Hollywood film starring Kate Hudson and Anne Hathaway, was released in Mainland China on August 20, 2015. In the Chinese remake, Angelababy and Ni Ni star as two best friends who make it their life’s goal to have the most perfect wedding of their lives. They are expected to be each other’s maid of honor, but when they discover that their weddings would be scheduled on the same day, the two women immediately have a major falling out and attempt to sabotage each other’s weddings. 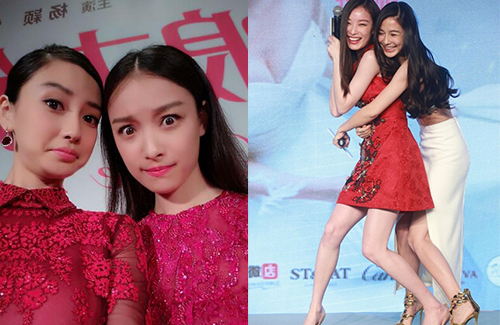 The hilarious movie also stars Chen Xiao (陈晓) and Zhu Yawen (朱亚文), portraying Angelababy and Ni Ni’s husbands, respectively. Angelababy’s husband Huang Xiaoming (黄晓明) makes a cameo appearance in the film as a superstar. Feng Shaofeng (冯绍峰) appears in the movie as a pastor. HAHAHAHHAHAHAHA this reminds me of Kendall Jenner and Gigi Hadid for some reason!